Super Dimension Fortress Macross is a space opera which mixes interstellar warfare with singer showbiz. After the earth is abruptly attacked by aliens the whole city evacuates to safety of the strongest warship-fortress Macross which in the confusion of war accidentally jumps to another part of the solar system and gets stranded. While it is a little bit disappointing that the show never confronts its stranded characters with political and sociological issues ala Infinite Ryvius or Battlestar Galactica, the fight for survival and a long voyage home is still plenty interesting. 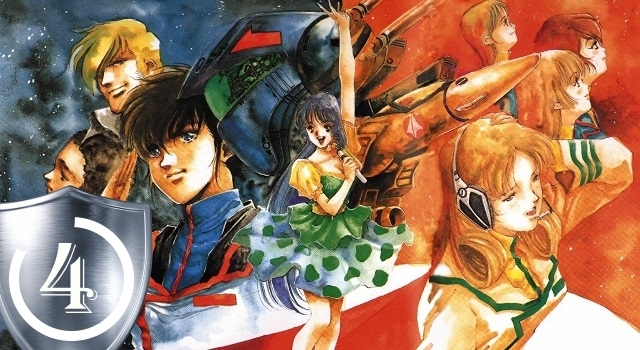 There are many characters, but the show mainly concentrates on a talented pilot Ichijou Hikaru and his love interest – promising songstress Lynn Minmay. As Hikaru concentrates on fighting battles, Minmay sings songs to raise the morale and unify the unfortunate stranded civilians. Her songs, however, turn out to be of much higher importance once it comes to light that they confuse aliens whose civilization has never had any ‘culture’. The plot itself is a little bit cheesy but interesting with the love triangle between Ichijou, Minmay and Hayase particularly well done. Unfortunately, there is a clear drop in quality during the last fourth or so of the anime as it seems the last part was just tacked on to tie a few lose ends and probably cash-in after the real story was already over. The production values have aged surprisingly well with eloquent character designs and beautiful backgrounds. Their actual movement might look unnatural and choppy at times, but it hardly retracts anything from enjoyment. Super Dimension Fortress Macross, while not a masterpiece, is a pretty good show offering a fine story, nice characters and even some thought-provoking material.